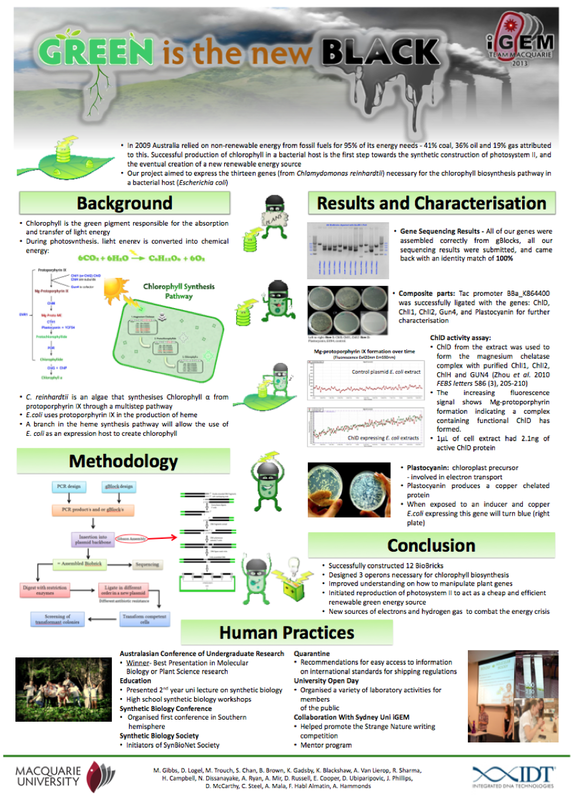 In iGEM, the purpose of the poster is to communicate the project to others in a very concise, yet engaging manner. Many posters in the past have been quite “busy” and “unbalanced” with regards to text, figures, and space. Although past winning posters may not have had this balance, it will be an important criterion in judging this year and in future iGEM jamborees. Teams may also want to look at Telling Your Story, a page which offers some guidance and examples for presenting your work. It's focused on crafting your wiki, but includes some general tips and tricks that may be helpful for both your poster and oral presentation. Please note that your poster may be smaller than these dimensions, it may not be larger. If your poster is larger, you may take up more space than the poster boards will allow, which may cause issues to the team next to you. In addition, some teams have elected to display supplemental materials at their poster station. These displays have included laptop/tablet presentations, team prepared pamphlets/handouts, and 3-D printed models. The supplemental materials will not be factored into the judging of the poster. Ability to Stand Alone: The poster should be able to stand alone as a clear communication of the project without the team present. Balance: The poster should be a balance of text, figures, and space. Please avoid using a lot of text - figures should play a dominant role in communicating the project on the poster. There should be adequate space around text and figures to avoid a crowded appearance. Judges will place heavy emphasis on balance. Overall Visual Appeal: Color and font changes should be used appropriately. The use of too many colors creates an unprofessional appearance. Dramatic colors should be used only to illustrate dramatic points – overuse can be confusing. There should be consistent use of color throughout the poster to represent the same concept - the colors should not be randomly switched. Due to red-green color-blindness, use of these colors to represent contrasting concepts should be avoided. A poster with overall visual appeal stands out among other posters. Legibility: The poster should be easy to read. There should be high contrast between the text and background. The background should not be busy and distracting. The resolution of the printed poster should be high enough that the text is clear and there is sharp detail on the figures. Avoid use of poor quality micrographs and other images on the poster. Poster text and figures may appear clearer on screen than on paper; therefore, a printout of the poster should be viewed prior to display. Quality of Graphics: The key concepts of the project should be diagrammatically represented. It is ideal if a single figure represents the entire concept. Figures should be well labeled and have clear legends. It should not be necessary for presenters to explain the figures. Conciseness: The content of the poster should be technically written. It should take no longer than 10 minutes for someone to read the poster. Remember, you don't need to show everything you have done on your poster, just the parts that tell your story. Flow: The poster content should follow a logical sequence. The reader should be able to navigate the poster with ease. Appropriate and Relevant Content: Careful thought should be put into selection of poster content. Redundancy in the presentation of information becomes tedious and exists at the expense of other information. Accuracy of Information Presented: The scientific content of the poster should be accurate. Models should be free of mathematical error. The poster reveals the STEM literacy of the team. Grammar/Spelling: Posters should be critiqued before printing for spelling and grammar errors. Scientific names and mathematical units should be presented correctly. Attributions: The poster is an opportunity to give credit to contributors who may not be present, and also to other scientists (e.g. earlier workers or competitors). Attribution should be for key concepts and not details (i.e. ~ 5 references but not 20). Oral Presentation of Poster: The poster presentations provide judges the opportunity for detailed probing. The team should be able to answer in-depth questions. This opportunity lets judges find out whether teams really understand the project. The posters will be critiqued by judges prior to the poster reception. The posters will be judged at this time to ascertain if the posters can stand on their own as clear communication of the project. Presenters should not approach the judges during this time. During the poster reception, judges will be visiting the posters and discussing the projects with team members. Evaluations of both the displayed poster and the oral presentation of the poster factor into the awarding of the Best Poster prize. Teams should be cognizant of the fact that judges involved in the awarding of iGEM medals and other prizes may use the poster reception as a resource for making decisions on those awards. In other words, all teams should strive to generate a high quality poster! Posters should be setup for display by end of the first break on Friday morning. Please don't wait until just before the first poster session. Judges will be critiquing the posters before the poster reception commences. A few team members should be present throughout the poster reception, but it isn't necessary to have all team members at the poster at all times. Keep in mind that the team members have expertise in various components of the project, so a judge may want to speak with different members about different aspects of the work. Teams should not select a single spokesperson for the team, nor should a single team member monopolize the oral presentation of the poster to the judges. Judges expect a “team” presentation of the poster, so make certain that all team members are prepared to contribute if called upon. Other members of the iGEM community may be visiting your poster when a judge arrives at the team poster. Teams should inform other visitors that they will have to return later because a judge is now present. Judges should be given top priority during the poster reception because they have limited time to complete their judging responsibilities. Your oral presentation during the poster reception should be concise due to time constraints. Have a 5 minute project summary ready when a judges comes by and be prepared to answer questions after delivering it.